It isn't that I expected a strong narrative from a 12 minute short, so I don't chalk this up to missed expectations. 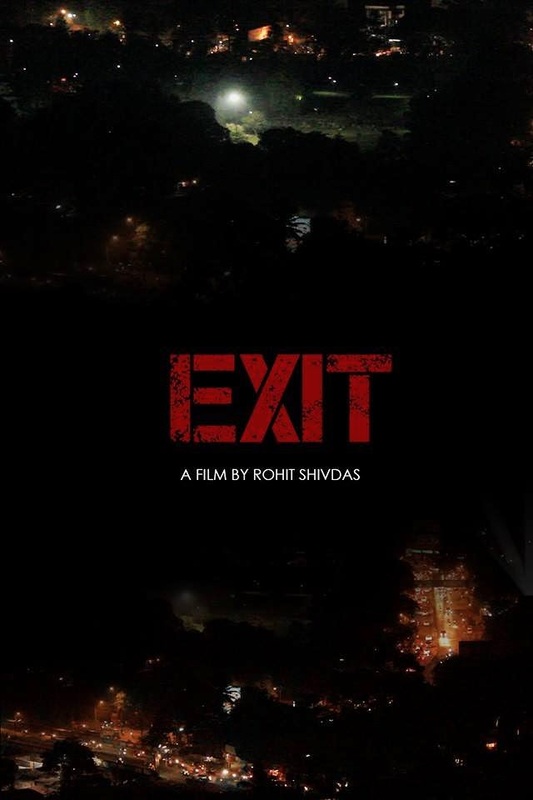 Before the first frame even hit the screen I anticipated the concept of style over substance would be very much in play in Exit, the new film by Rohit Shivdas, so I'm not here to stomp all him for that. Honestly, that wouldn't be fair. What is fair game though is to question the various choices of music Rohit felt would fit the tone of this short. I don't know what it is about a 12 minute exercise in an aspiring filmmaker trying to better acclimate himself with the camera and trying to find himself and his potential style, but I don't want the rock outfit Imagine Dragons to be anywhere near it. During the opening credits, we see lyrics from the song literally spelled out for us on the screen and I felt as if I was watching an amateurish music video rather than the start of any sort of original vision. Instantly I felt a disconnect with what I had hoped for when I pressed play. The performances were flawed, but that is to be expected, and I could quibble over the fact that the sound mix seemed to be a split second off from the mouths we see moving during the fleeting moments involving dialogue, but again I can forgive these issues because I would hardly expect perfection. Suddenly though, at almost exactly the 7 minute mark the very familiar track Nightcall by Kavinsky comes blaring through my speakers and we are greeted with a grand shot of a cityscape lit up at night, a sequence that seemed to go beyond being simply influenced by Refn but rather more like an attempt to flat out duplicate the magic of Drive. I don't watch short films from young filmmakers because I want cover songs. I watch them because I want a unique vision, I want to feel inspired by the passion seeping through the frames on the screen. Caring deeply about your work is far more appealing then familiarity, even when it misses the mark. By using songs by Grammy winners and those already utilized with perfection in cinematic masterpieces, all I do is relate what I am seeing to something much stronger that has been done before. Originality is crucial, and Exit desperately needs some. So funny. It seems everything was wrong with the short movie. Well, you were asked for an honest opinion and that's what you gave. Kudos. Thanks for reading Francene and yeah, I actually believe it would be doing the people who made this a disservice to say generic compliments to them rather than tell the truth. How would someone develop the thick skin needed to succeed in the industry? How would they learn from their mistakes and grow?